People around the world commemorate the resurrection of Jesus Christ with a yearly religious Easter celebration. Take a closer look at the traditions that surround this holy season. According to Biblical accounts, Christ proclaimed during the Last Supper that he would be betrayed by one of his 12 Disciples. After the meal, Jesus and a few of his Disciples went to the Mount of Olives to pray. It was here that Jesus was found and arrested by an angry mob of priests and other religious leaders after being betrayed by his Disciple Judas. After his arrest, Jesus was flogged, whipped, spat on and mocked by his captors and bystanders. He was forced to don a crown of thorns. Jesus was also forced to carry a large wooden cross to the place of his crucifixion. On the hill of Golgotha, Jesus was crucified. It is said that at the sixth hour of the crucifixion the sky turned black, the winds howled, and the earth shook. 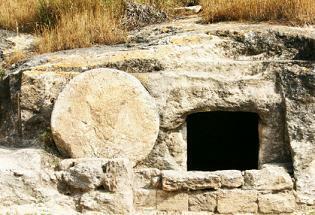 After Jesus died, his body was placed in a tomb, the entrance blocked by a large boulder. On the third day, women came to complete the anointment of the body, only to find that Jesus was no longer in the tomb. This, the day of the Resurrection of Christ, is the heart of Easter. The Easter celebration does not last for merely one day, it actually covers many weeks in the spring. Ash Wednesday - This day begins the Easter season. In some religious traditions, worshippers receive ashes marked in the shape of a cross on their foreheads as a sign of repentance for sins. Lent - This time period, beginning on Ash Wednesday, lasts about 40 days. During these days, those who participate forgo specific foods and abstain from activities of their choosing. Palm Sunday - This is the Sunday before Easter and commemorates the preparations made in ancient times for the Crucifixion of Christ. Holy Thursday - A feast is held on the Thursday before Easter in honor of the Last Supper. Good Friday - This day commemorates the Crucifixion of Christ. Holy Saturday - The Saturday before Easter is observed in honor of the day Christ was laid in the tomb. The end of the Easter season is marked by Easter Sunday and the Easter celebration. Families celebrate this holiday in different ways, but there are a few basic traditions that take place at most family gatherings. Symbol of rebirth - The egg is considered a symbol of fertility, birth and rebirth. The Easter egg hunt is conducted to celebrate these concepts. Ancient Roman traditions - These ancient people believed that life comes from and begins with an egg. This tradition states that Easter eggs are "hunted" as a representation of the celebration of life. Christian symbolism - Many Christians hold an annual Easter egg hunt as part of the Easter celebration because it is considered the "seed of life" and representative of the resurrection of Christ. With its diverse origins, an Easter egg hunt is suitable for even non-religious Easter celebrations. The Easter celebration is about remembering the sacrifices of Jesus Christ and not the food. Who says you can't have a barbecue or picnic on Easter Sunday? There is also nothing that says you have to stick with the traditional Easter meal of ham. However you choose to celebrate, make it a time for you and your family to relax and enjoy each other's company.